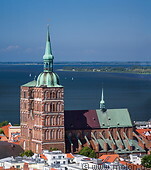 In Stralsund there are three churches built in brick Gothic style with tall towers. The St Nicholas church is an evangelical Lutheran church on the Alter Markt square completed in 1270. Built in brick wall Gothic style, it has two towers of which one has a Baroque dome and the other a temporary roof. St. Mary's Church on the Neuer Markt square is a large Lutheran chuch also built in brick Gothic style, whose main tower is 151 metres tall. The construction of the St Jacob church started in 1303 and was completed in 1488.